Early 1800s commercial structures along the National Road in Brownsville, Pennsylvania. The building at far right is the subject of discussion. The building at far left has also been demolished as of Fall, 2017. As I have written and advocated for historic preservation in Western Pennsylvania on this blog for several years, I have taken stock of important, early structures in depressed urban areas. I consider myself an unofficial steward for unnoticed and neglected historic buildings. I check on them from time to time, dreading the day when they will disappear. In some cases, buildings survive and are restored. Most often, they languish and decay. Some of my favorite places are also places that I find myself hesitant to return to, knowing that I will find some magical elements missing that were intact upon earlier visits. This is the case with Brownsville. Within the Pittsburgh metro, it is one of the earliest and most intact urban villages, with many buildings dating to the early 1800s and late 1700s. This is not common in western Pennsylvania. There are no intact neighborhoods within the city of Pittsburgh from this era. The Great Fire of 1845, and massive urban renewal programs in the 20th century, took care of that. 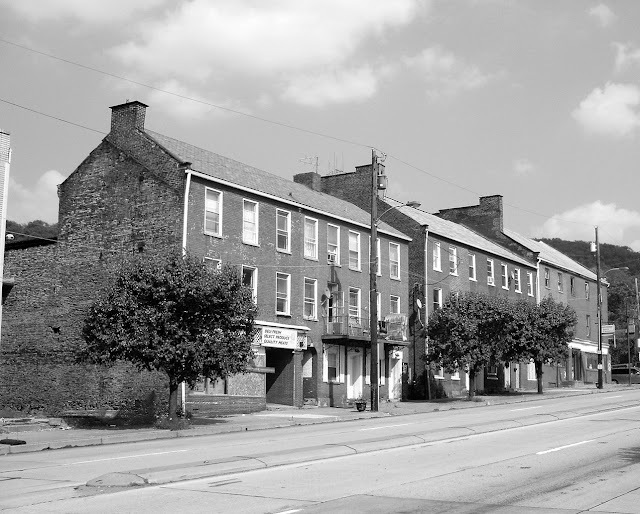 One can imagine what the earliest Pittsburgh neighborhoods looked like by taking a trip to Brownsville, and walking along Front Street or Market Street in the North Side Historic District (on the National Register). 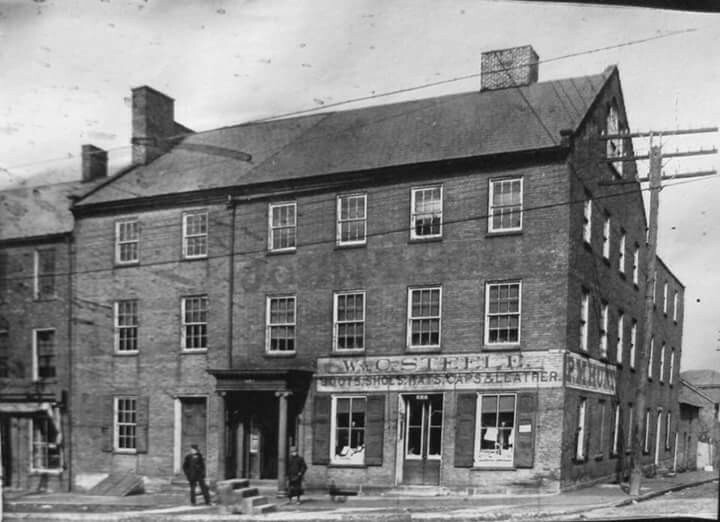 It was along Market Street that you would find a row of early 1800s commercial structures, which were probably constructed around the time of the historic National Road, and some earlier than that. At the corner of Fifth Avenue and Market Street (National Road), was one of these structures. "It is the row of large buildings on the north side of Market Street, constructed between circa 1815 and 1840, which best reflect Brownsville's early importance as a commercial center on the National Road. Urban in scale, these structures are vernacular copies of those being built by the mercantile class in America's coastal cities at the time. The earliest, at the corner of Market and Fifth Avenue, was constructed, circa 1815, for George Hogg, whose mercantile partnership with his uncle William expanded as the frontier moved further west." Above: The circa 1815 commercial structure at the corner of Market and Fifth Ave., Brownsville. On my last visit to Brownsville, the building was gone. I do not know when it was demolished. I have not been able to find a record of that. When I photographed Brownsville in 2011, and on subsequent visits (until now), it was still standing. And there it is on Google Maps street view. I do not know if I can emphasize enough how rare, and important, and historical this building was. In my years of blogging, I have never reported on a more terrible loss for preservation. There is no record of anyone making a stand for the building. There was no indication in the press that it would be demolished. There were no petitions, no advocates, no preservation officials making statements. I do not delight in being the first. It's tragic. It should not be this way! We should appreciate our local history. A commercial structure of this era, one of the last of its kind in this region, is irreplaceable. An isolated historic building from the early 1800s is one thing. This was an intact urban block. I have trouble comprehending the apathy that led to this development, where a vacant lot stands today, and a 200 year-old building is destroyed. I understand the problems of urban blight. I understand the economics of the area. Still I do not understand a community allowing this to happen. My suspicion is that nobody who decided on or granted the demolition knew or cared what the building was. It was just an old building. For those of us who look for beauty in the things around us, and love our communities, and want to make the world a better place, the ignorance that leads to a result such as this is devastating. Well, I have written this building's eulogy. I have taken some time in doing so. The only way to cope with the loss of a treasure is to hope that it can serve as a lesson. There is a massive conflict between preservation and blight removal. The future of our cities does not depend on the amount of prairie. The mystique and atmosphere of the National Road in Brownsville might have been its saving grace. The circa 1815 Brownsville Hotel, as pictured in a vintage photograph. If you are the owner of this photograph, please contact me for appropriate credit. Thank you. Thank you Jonathan for your article. It is so sad. I live near Brownsville and it was a bustling town when I was younger. Now the buildings are condemned and you never know which one they will tear down next. The building was for sale for several years; as a local business owner, I looked at the online listing in hopes that it might be something I could afford to purchase and restore as a new location for my business. Sadly, it was so decayed already that restoration just to a safety level was beyond my budget. I believe it was demolished early this year. I know it came as a surprise to me; not sure if a new owner made the decision or if the seller thought a vacant lot would be more marketable. I agree it is very sad. BARC has claimed for years that its goal is restoration and preservation, and yet the town continues to decay. The porch roof recently fell off another historic property, the Rose House on the other side of Market Street, and it wasn't even cleaned up for several weeks. It is a tragedy that so many of these structures are so far gone that restoration is increasingly unlikely. Thank you for your comment! If you find another historic building in Brownsville for your business, I'd love to help you fix it up. BARC is a joke. They are only interested in scamming people. And the rest of the town is no better. There is no interest in helping new business, in fact they hinder new businesses. To rely on them for any preservation is only for where they can make a profit. I cried when this building was torn down. I had looked a the real estate ad and it was too far gone inside. Then they had a chimney collapse. Became a hazard. The Brownsville Hotel building was demolished last year in late November, early December. The Facebook Group "You Know You're from Brownsville When..." documented the demolition with numerous photos, here are a couple of the posts: https://www.facebook.com/groups/216718061713521/permalink/1302116099840373/ https://www.facebook.com/groups/216718061713521/permalink/1311146178937365/. I also had looked at purchasing the building, even had a structural engineer assess it. Overall the structure was solid, but had a couple walls that needed work and as the previous poster indicated, the building required extensive restoration to bring it up to code. The apartment building next to it, built around the same time period as the hotel, currently is for sale too. But it also requires significant restoration, hopefully, it won't be lost to the wrecking ball too.